Tobacco mosaic virus (TMV), also known as tomato mosaic virus, is one of the most damaging diseases to affect tomato and other plants. Symptoms are stunted growth and reduced yield. Did you know that in 1898 TMV was the first virus ever discovered, and the term "virus" was derived from the original description? 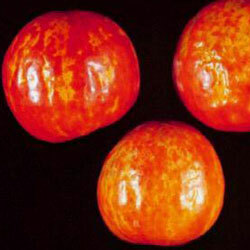 TMV is the most common virus affecting tomatoes. Other common plant hosts for the mosaic virus are pepper, petunia, snapdragon, delphinium, and marigold. Leaves become mottled with yellow and green spots. The dark green spots often appear thicker and somewhat raised giving the leaves a blister-like appearance. Mottled areas may turn brown and wither. Plants infected with TMV may be stunted and produce few fruits. Sometimes identification of the disease is confused with herbicide or air pollution damage, but usually a mottled appearance is in fact caused by TMV. The most common sources of infection are the debris of infected plants that remains in the soil. Infected tobacco products can contaminate workers hands. Cigars, cigarettes, and pipe tobaccos can be infected with tobacco mosaic virus so smoking around plants should be discouraged and workers/gardeners should wash their hands after smoking. 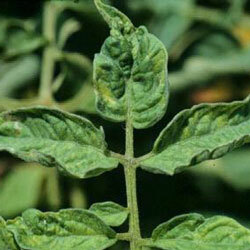 Virus from infected plants can be easily transmitted to healthy plants mechanically or by insects. Remove and destroy any symptomatic plants. Avoid use of tobacco around tomato plants. Use only certified virus-free seed. Sanitation is the single most recommended practice to control TMV, because transmission of the virus from plant to plant usually occurs from contaminated tools or hands. After removing diseased plants, wash your hands and decontaminate tools. Once plants are infected, there isn't much you can do to get rid of the virus. There are no chemical sprays that will prevent, control or eradicate viruses. Insecticidal soaps can reduce carriers of the disease.